Future Proof Docs - Stress Free Mom MD — Future Proof M.D. Welcome to another installment in the Future Proof Docs series. As a reminder, this is a series of posts highlighting physicians who excel at something outside of medicine and care enough to share their passions with us. Today I want to introduce the Stress Free Mom MD. Dr. Maiysha Clairborne is an integrative family physician and a thought leader in the campaign against physician burnout. I hope you will enjoy this Q&A. Supporting them in Creating a life of their design. Dr. Clairborne has a passion for delivering trainings, workshops, keynotes, and retreats on burnout prevention & recovery, finding passion & purpose in medicine, and empowering doctors through physician leadership. She has presented in arenas such as the International Conference on Physician Health, CPR in Progress: Physician Women's Wellness Conference, and the Atlanta Medical Association. Dr. Clairborne is also very active in the graduate medical education community, providing her burnout and life balance topics for students & residents from several institutions including the Atlanta Medical Center, Northside Hospital, Gwinnett Medical Center, Emory University, and Morehouse School of Medicine. In addition, Dr. Clairborne, co-hosts radio show “The Wellness Blueprint”, and has authored two books “Eat Your Disease Away” & “The Wellness Blueprint”. She regularly writes articles for her blog StressFreeMomMD.com, as well as TheHappyMD.com, and KevinMD.com. She is also a regular article contributor to Doximity, QuantiaMD, MomMD, and other online physician blog forums. Maiysha began her training at Emory University with her Bachelors in Psychology. She went on to medical school at Morehouse School of Medicine. Followed by her Family Medicine Residency at Florida Hospital in Orlando, FL. She is trained in acupuncture, NLP, and is currently an Integrative Medicine Residency Fellow. Dr. Clairborne is Associate Clinical Professor with Morehouse School of Medicine, and ongoing guest faculty with Emory University School of Medicine. I chose Family Medicine because I know that I get bored easily and I needed to be in a profession where I’d see a wide range of people and conditions. I also knew FP was the most versatile specialty to incorporate “Complementary/Alternative Medicine” at the time. When I realized that I had a passion for empowering physicians, I knew the next step was to start writing and contributing relevant information. In my integrative medicine practice I had already been blogging for years and had gained a pretty significant following. So, for this platform I had to do the same. I think I started it sometime in 2013, but didn’t get super consistent with posting until 2015. Since then I’ve really had great feedback on the articles. The biggest issue is time (I’m sure that’s the first time you’ve heard that one…). Not only time to write, but time to post, and manage social media. How I get around that is that I put a solid structure in place. I use a virtual assistant to manage my blog posting, social media posting, and e-newsletters. I have Infusionsoft that runs my e-newsletter and campaigns that funnel into sales automatically. Finally (for the writing), I schedule 1 hour/week on my calendar to write. I personally put myself on writing assignment (1 article a week for a year). It takes an incredible amount of discipline, and it’s super rewarding when I put out an article each week that receives lots of great feedback and especially when I can get published on a forum like KevinMD.com. We have to remember to take care of ourselves. We have spent so much time being told what to do (med school, residency, and even out in practice) that we forget we have choices. We forget about ourselves. We need to remember that we have choices, and that we can choose ourselves from time to time. Create you career around you life, not the opposite. In order to do this you must begin with the end in mind….know what your ideal life looks like. When you know what you want in your life, you can create a life of your design, rather than the default life we have been handed throughout our training and careers. You are NOT alone. Don’t be afraid to reach out for help when you feel stuck. This is what coaches and consultants are for. We as physicians are way behind the times when it comes to hiring executive coaches to help us to reach out goals or find balance in our lives. There are resources available… Be courageous enough to utilize them! Physicians Behind the Times: Why Don’t more Doctors hire coaches? 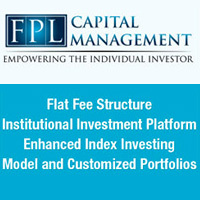 FPL Capital Management is a Fee-Only independent investment advisor. They offer investors Model and Customized portfolios which are low-cost, passively managed, and globally diversified. Portfolios include funds from companies such as DFA, Vanguard, AQR, PIMCO, WisdomTree, and iShares. Unlike most other advisors, FPL has separated asset/portfolio management from wealth management. Separating these services allows them to serve clients in a cost-effective and a prudent manner. Another unique feature of the firm is that they charge a Flat Fee for advisory services, while most other advisors charge a percentage based on assets under management.